The Datalogic Taskbook is the ideal partner for those who place high demands on their equipment in warehousing, transportation and logistics, and who accomplish a variety of demanding tasks on a daily basis. 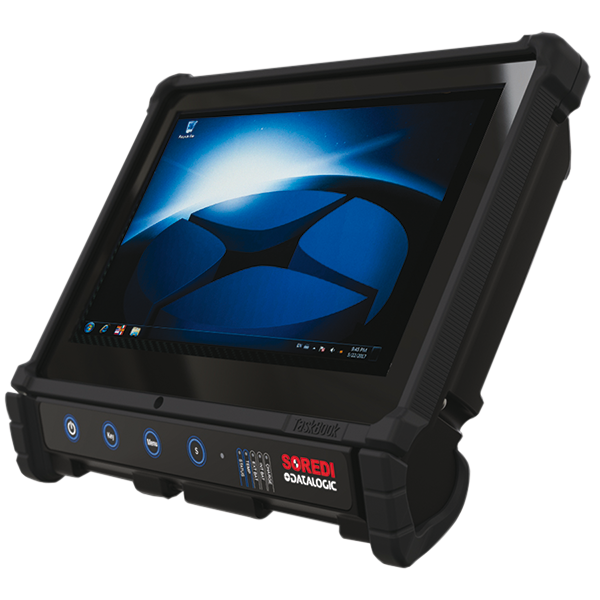 The Taskbook is reliable, absolutely robust, fast and incredibly versatile - and works great in forklifts. The Taskbook is robust. The versatile terminal is available with an anti-reflective 7’’ or 10’’ WSVGA/WXGA multi-touch display with 1.6 mm thick Corning Gorilla Glass. The mobile computer sits securely in a robust, rubber-covered aluminum frame and has IP65 certification. It is also impact-resistant from 1.2 m. The battery capacity is 2,500 mAh. The operating system is the proven and user-friendly Windows 10 IoT Enterprise. A 1.46 GHz Dual-core processor, 4 GB RAM and 32 GB memory (which may be expanded to 64 GB or even 128 GB, if required), ensure for excellent performance of all tasks. Datalogic offers versatile accessories for the Taskbook. Among other things, a handgrip is available that may be equipped with an additional 2,600 mAh hot-swappable battery or a 2D imager (standard up to 1.1 m or extra-long range up to 15 m). Order the Datalogic Taskbook with your sales representative! Call today!